As a recent letter to the South Wales Evening Post showed, almost as many people were taken in by Martin Durkin's Channel 4 documentary (also shown on S4C) entitled "The Great Global Warming Swindle" as believe entirely the word of Al Gore in "An Inconvenient Truth". While virtually no climate scientist will state that all the global warming which started in the late 20th century is caused by man's efforts alone, few - unless they have a vested interest - will say that man has not contributed and is not contributing to the increase in greenhouse gases and thus global warming. Al Gore may have over-simplified the case against carbon dioxide, but Durkin, through using misleading graphs, turning a blind eye to some data which came in after 1991 and selectively quoting a respected scientist (who considered suing as a result), presented a dishonest case for the defence. Durkin has form. A previous documentary of his had been found to distort the truth. Chris Huhne, the LibDem environment spokesman, felt strongly enough to ask for Channel 4's comments on green campaigner George Monbiot's view that it was distinctly odd for Durkin to be commissioned again, in view of the ITC's earlier findings against him. There is an even more trenchant criticism of the 2007 programme which suggests a far-left political motivation. Those of us who can afford the time and money for broadsheet newspapers as well as watching TV are able to take in a broader and more objective view of the climate debate. Unfortunately, there has been no significant attempt on TV to put the various films and documentaries into context. foodcarbon.co.uk it is probably the best for an overall estimate." Many people reading this will have received, in the mail, a well-produced printed statement of criminality directed against a potential candidate in the forthcoming Welsh Assembly elections. These allegations are serious, and, if true, would surely disqualify the person concerned holding public office. They merit investigation by the proper authorities or, if the author believes the judicial process has failed, another investigative medium. However, an anonymous attack is dangerous for public well-being in general and the political process in particular. That is why there are laws against anonymity in publishing printed material. That is why, although my party would appear to be the main beneficiaries of this attack, I shall be referring my copy of the communication to the police. There is new housing going up all over the county borough. But can the infrastructure - sewerage and roads in particular - cope? All the county borough's money appears to be directed towards the new Port Talbot southern distributor road. Ordinary scheduled maintenance is clearly suffering. Regular travellers remark on the poor quality of the road surface in Neath Port Talbot compared with the roads in Powys. A Welsh national cricket team? I trust that the Plaid Cymru AM who suggested that Wales aspire to a national cricket team which competes in the World Cup has had second thoughts after watching Scotland's dismal performance in the Caribbean. Competing in the county championship, Glamorgan has done more for Welsh pride and reputation over the years than any separate national side would do. The biggest give-away was not the 2% cut in the basic rate. That doesn't take place until next year, and will in any case largely be paid for by the abolition of the 10% starter rate. No, the chancellor is rewarding the section of the population most likely to vote - the over-65s. He will take more pensioners out of taxation than any other section of society. He figures that the pensioner population, who pay a larger proportion of their income in council tax than the richest ten per cent of the population, will be mollified by reducing their income tax burden. He has not addressed the inequity of the council tax as such, nor is Tony Blair bothered. Neath and Aberavon constituencies must have a higher proportion of pensioners in poverty than most of the UK and will suffer accordingly. In reply to a question from Ming Campbell, the prime minister acknowledged the high marginal rate paid by the poorest in our society, because of council tax. However, his only response was to point to the Lyons Commission which, if early reports are to be believed, does not consider any alternatives to council tax. Once again Labour shows their love of big business and contempt for small business. Corporation tax is to be cut, but small company taxation is to be raised with virtually immediate effect. This is going to hit a large number of small enterprises in this borough and adjacent areas. I am particularly concerned about the effect this is going to have on those companies pioneering green solutions to our energy problems. We would be interested to see any other views of how this budget will affect the local economy. Dulais Valley Primary Care Centre. Why isn't there a health centre serving Cimla and the Pelenna valley? In the mid-1990s, Councillor John Warman organised a campaign for a general practitioner to be located in Cimla. A massive petition was raised, and hard work was rewarded with a doctor prepared to make a go of a local surgery. Unfortunately, he was unable to build up a solid list of patients, as too many people, faced with a choice of leaving the list of a GP in Neath, and an untried practice (they couldn't register on two lists), preferred to stay with the doctor they knew. Therefore, the business (a GP surgery is a small business) failed. Well, a hundred or more extra households on the Cimla, for a start. But even in 1999, Cimla residents (as part of the Agenda 21 consultations) were again calling for a local health centre. They were fully aware of the earlier failure of the GP surgery. Then there is the difficulty that Pelenna residents are facing: the ending of a regular surgery in the valley. Most are registered with doctors in Cwmavon. However, the young, very old and the infirm cannot drive there. If they can't get lifts, then they have to rely on two bus-routes with often a long lay-over between services. In the wake of the Harold Shipman affair, the single-handed GP practice is virtually a thing of the past. There is a trend in the Welsh NHS towards salaried health professionals. A health centre does not have to run as a business, and can afford to take the long view. Modern equipment and computer facilities can be shared by nurses and doctors. It makes sense to provide a health centre in the Cimla which is directly accessible from Pelenna. Let us give credit where it is due, to council leader Vaughan and his team. However, while we still suffer this iniquitous tax, further progress can and should be made, without cutting essential services. 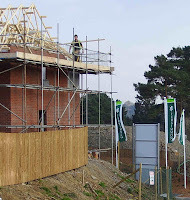 The continuing increase in high-banded housing in the borough, in particular Llandarcy village, will aid the process. If not the starting gun, then this weekend's conference is the final warm-up lap before the Welsh Assembly campaign starts in earnest. Conference will endorse the 2007 manifesto, without, it appears, any dissension predicted. What a strange Welsh Liberal conference that will be! the houses of ordinary citizens safe. Maintaining a police presence at the Cilfrew protest against the siting of a gas transfer station caused officers to be withdrawn from local towns like Skewen, as Emma Denholm's report in the Neath Guardian explains. Frank Little writes: "Let me be clear. I am in favour of the gas pipeline, as it reduces England & Wales dependence on supplies from an increasingly capricious Russian state-controlled utility. "However, it was wrong to divert police resources to what is basically a security company job. The implication that these respectable people now find themselves on a central police database of criminal suspects is very worrying."